Winner of the Gold Sofi Award for Best Cookie! This award from the Specialty Food Association is like the Oscar of the food world. 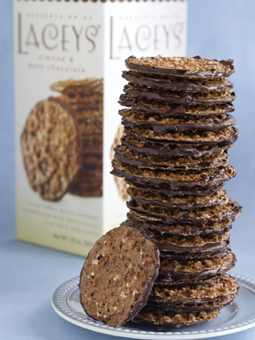 Ultimate Lacey (almond, dark chocolate, orange and lemon peel) - available by special order. Baklava used to be hard to find in Arcata, California. But that was before Emran Essa moved to the area to attend Humboldt State University. “I missed the baklava from home so much, and there just wasn’t anybody making it here,” he remembers. Trusting his taste buds and memories of home, he began to experiment. After three years of compliments from his friends, he approached a local store and began selling it there. Slowly, his business grew, and now Emran is selling his products all over the country. 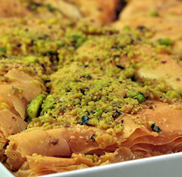 Baklava is a dessert common in many parts of the Middle East, but believed native to Assyria. Phyllo dough, finely chopped walnuts or pistachios and honey are traditionally the key ingredients. However, everyone loved the sweetness of almonds mixed with walnuts and a light syrup, so Emran innovated an almond-walnut baklava. To chocolate lovers their most tempting confection is the Baklabar, an individual serving of baklava dipped in chocolate. “I was trying to interest a shop in Seattle in carrying our baklava, but everything they sell has to be chocolate. So, I went back and dipped my baklava in chocolate. The shop still didn’t want to sell it, but we had a very popular product!” Emran laughs.